Emil Torday (1875-1931), Hungarian by birth but educated both there and in Germany, arrived in Brussels at the age of twenty. Although he began his professional career as a bank clerk, by 1900 he had abandoned finance, becoming a Belgian commercial agent in King Leopold’s Congo Free State. Four years in this position resulted in a great deal of travel based in the Katanga area of southeastern Congo, where his interest in African cultures, particularly the Luba, developed. He made contact with the British Museum in 1904, when he returned to Europe on holiday, and contacted Keeper Charles H. Read of the British Museum, giving the institution a selection of Luba items. He and the British Museum came to an agreement—he would return to the Congo to work for the Belgians, but would also collect for the museum, sending photographs and research results to curator T. A. Joyce. An extended trip for the Belgian Compagnie du Kasai followed in 1905-06, allowing research among the Hungaan and Yaka, among others. 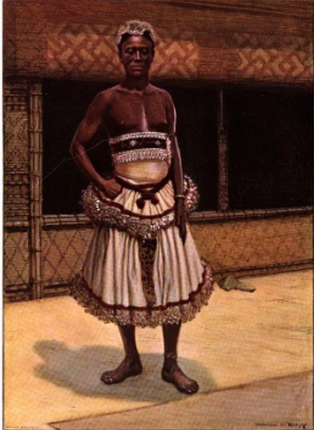 Then, supported by the British Museum, he left his job and returned to the Belgian Congo from 1907-09 to fully concentrate on research in the Kuba kingdom and neighboring territories. Simpson, 26, shared photographic duties with Torday, and the artist Norman Hardy sketched and later produced watercolors of the people and objects viewed. Hardy stayed with the others for only six months, never reaching the Kuba capital. The senior of the trio at 43, he had already created ethnographic images in the Pacific islands, and later reproduced tomb paintings in Egypt. Despite the camera, artists’ services were still useful, providing both color indications and details. Africa’s humid heat wreaked havoc with film, and it was difficult to wash the development chemicals properly (Mack 1990: 31). Torday’s memoirs mention mutual practical joking with Hardy, but also underline the great esteem in which Torday held Buya, an eight-year-old Yansi boy. Buya, son of a chief who had become Torday’s friend during an earlier Congo stay, was a bold child who creatively shamed and cursed at recalcitrant leaders (of a different ethnic group, to be sure), helping to ensure the travelers’ passage continued. 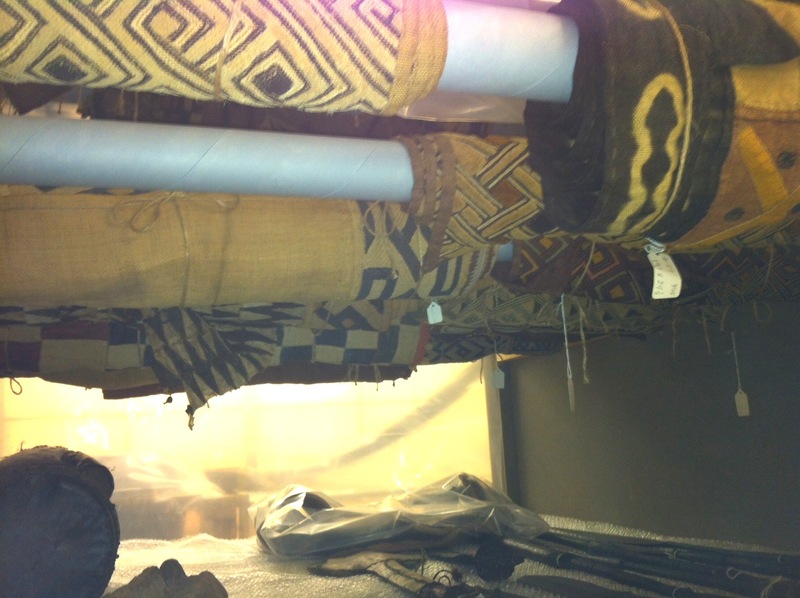 As a collector, Torday bought numerous items from the Bushoong, Ngongo, Lele, Wongo, Luba, Mbala and other Congo peoples. Transportation of these items required many tin chests, carriers and middlemen, since over 3000 items found their way to Europe. Most ended up in the British Museum, although nearly 400 are housed in Oxford’s Pitt-Rivers Museum. While Torday certainly considered some of the pieces “specimens” of various cultures, he also clearly appreciated their artistry. Years later, he wrote about his acquisition process: “By now the Bushongo had found out what the things were we wanted, and that it mattered little that a wooden carving was broken, if the workmanship was remarkable” (Torday 1926: 193). Torday’s facility with language (he learned at least eight African languages [Hilton-Simpson 1911: 8], as well as numerous European tongues) permitted the kind of sociability that allowed the acquisition of both knowledge and goods. During his four-month stay at the Kuba capital, he became a companion and sympathizer to its Bushongo ruler, Kot aPe, who granted him a court title. 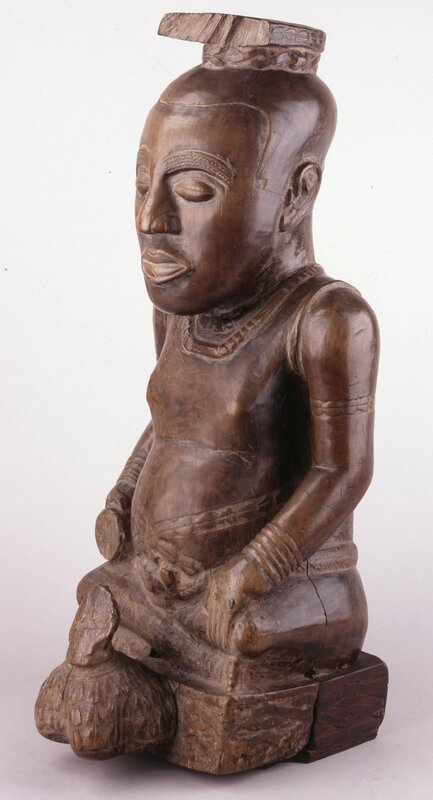 Seeing the royal Kuba portrait figures excited his desire to acquire one for the British Museum. After some encouragement and persuasion, the ruler “wanted it to go to a safe place and be seen by people of all nations,” persuaded that it might otherwise “perish any day by fire, or by some unfortunate foreign invasion.” Using reverse psychology as the ruler advised, Torday convinced the nobles (who were usually opposed to the monarch’s wishes) that he wanted to protect the sculpture, but Kot aPe had refused. This stratagem succeeded, greased by payments to each titled man, since the sculptures were corporate property. Not one, but four such portraits ended up in Torday’s hands, along with many boxes, cups, masks, cloths and other objects purchased from the Kuba and other Congo peoples with cowries and trade goods. Torday’s final trip included a disastrous run-in with a rhinoceros, which left him with severe pain and mobility problems. These issues were somewhat mitigated by his satisfaction in seeing at least a small selection of the pieces he had collected displayed together with some field photographs at the British Museum, a contextual approach rare in contemporaneous displays (Mack 1990: 86). Torday spent time writing, but also sought a rest cure for a gastric ulcer. On August 27, 1912, Dr. George Byron Gordon, director of the University of Pennsylvania’s University Museum of Archaeology and Anthropology, contacted Torday about coming to Philadelphia. The lure was a proposed museum expedition to the Amazon Valley. 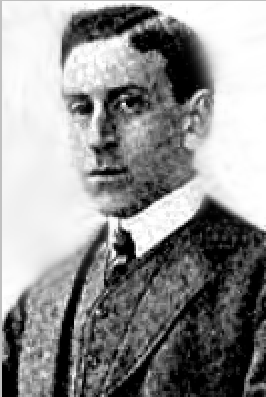 Gordon was coy in his phrasing—“The offer of the position of ethnologist on this expedition would be rather premature at the present writing”—but did intrigue Torday, who was “pleased to consider” the possibility, and agreed with Gordon that he could also deliver a number of public lectures on his African journeys. In the exchange of letters that followed, Gordon also offered a more concrete proposal: that Torday might catalogue the museum’s “considerable collections from the Congo”, and that their acquaintance might lead to an African expedition. Torday challenged the notoriously tight-fisted director about his financial arrangements, ensuring not only a pay increase but the inclusion of his passage costs. 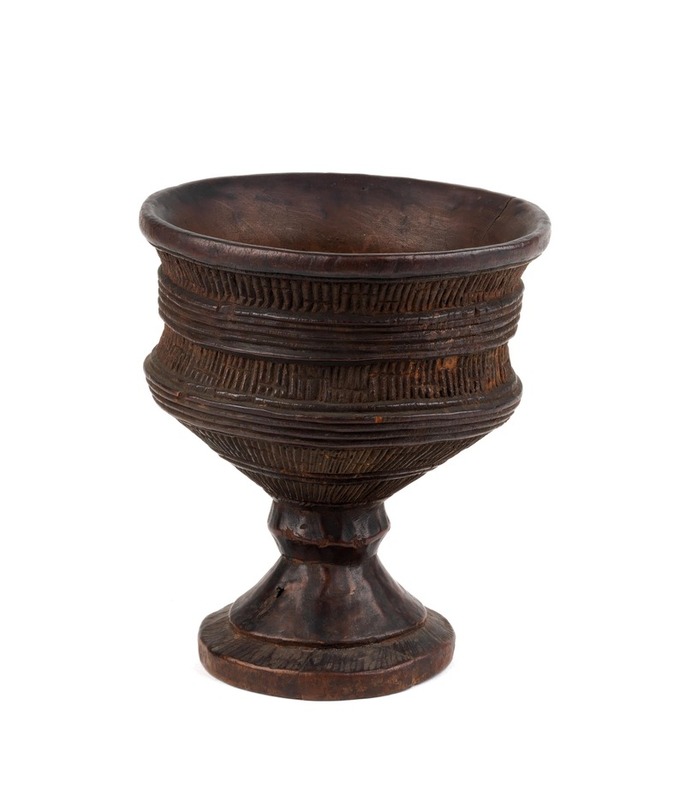 Kuba palm wine cup collected by Frobenius. Object: AF431g. Courtesy Penn Museum. a three-month contract. His time was spent cataloguing works purchased from the German dealer J. F. G. Umlauff in the summer of 1912 that had been collected by Leo Frobenius during his 1904-06 trip through Central Africa. Torday disdained Frobenius and his methods, considering him less an ethnologist than a disinterested and disengaged shopper. Torday’s familiarity with the region allowed better identifications than Umlauff had listed, and he left notations of changed attributions on the museum’s catalogue cards. 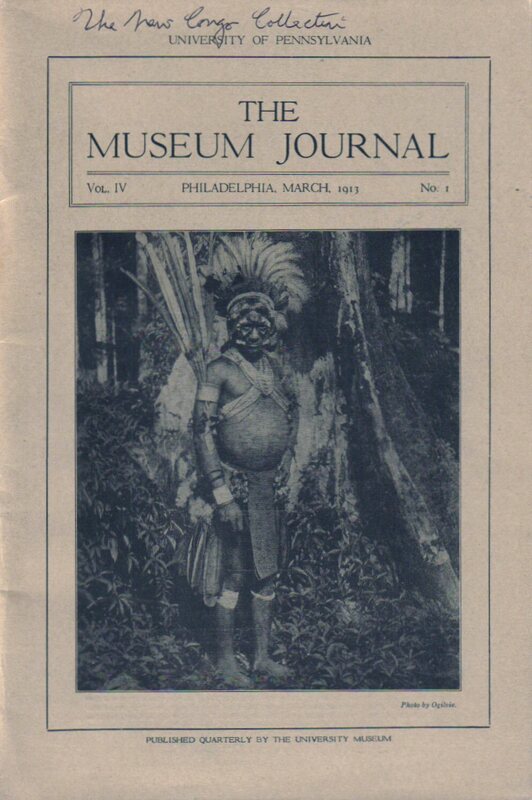 While there, he created a small display of the Congo collection, delivered two public lectures, and wrote an article for the Museum Journal that presaged his 1925 popular travel account On the Trail of the Bushongo, including many of the same anecdotes and passages. The Amazon expedition left Philadelphia on March 19th without Torday, who returned to London at the end of the month. No further mention of an African expedition was made. Torday offered Gordon items he had brought along from his own collection, leaving them behind on speculation. Like others before him, he found it necessary to prod the museum director for a decision and payment, but he had greater success than many. On May 5, 1915 he enlisted some of the same craftiness he had employed in Africa: “Would you let me know what you have decided about my collections? Should you not want them you would not mind, I hope, sending them to an address I would give you.” Within a month, the deal was consummated. Gordon paid only $280 for a few dozen objects from the Bushoong, Lele, Luba and neighboring groups. 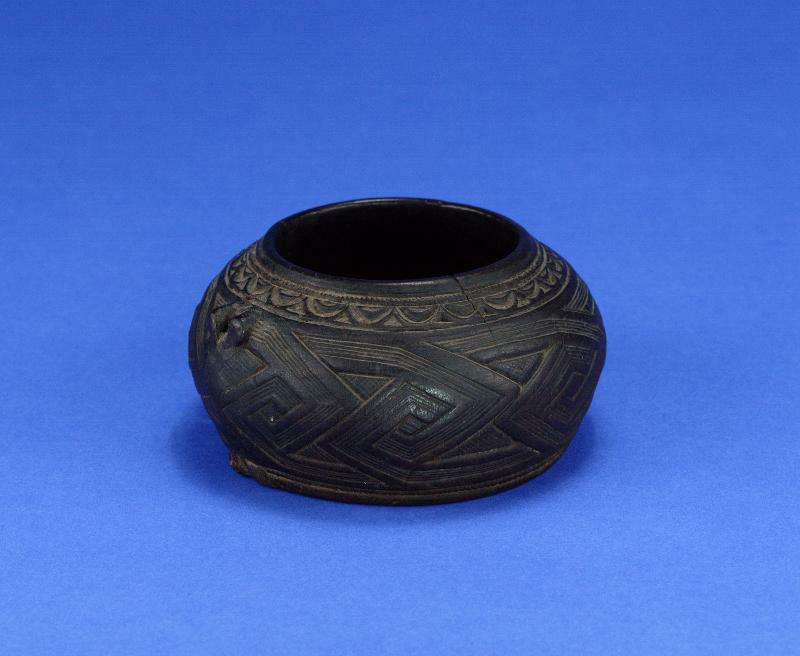 These included arrowheads and a few textiles, as well as a fine Bushoong divination implement and some well-sculpted boxes and cups from the Wongo, Lele and Pende. Click to read one of Torday’s books for a popular audience. he was interned in London because of his citizenship. His work afterwards was that of an independent scholar who had transitioned from merchant to researcher. Torday was in the vanguard of the budding discipline of anthropology, his agreement with the British Museum serving as a catalyst. Employing the “Notes and Queries” approach (Mack 1990: 29), he aimed for a broad overview of culture, creating a compendium of information: migration origins, folktales, designs and their names, burial customs, and more. Torday accomplished much in a surprisingly short time, his numerous books and articles based on fieldwork completed before he was thirty. Though he operated during the height of the colonial mindset, Torday believed in direct involvement with people, mutual respect, and adaptation. His genuine liking for the people he encountered occupied him throughout his life, not only in scholarly ways, but through activities with the Save the Children International Union (Mack 1990: 89). It’s the first official day of summer, with the realization that our opening day, August 28, is drawing closer. Why not sign up for our Facebook Page https://www.facebook.com/pages/At-Home-In-Africa/327849547371845 and our Twitter account @athomeinafrica1 so that you don’t miss out on events, posts, and stories about African design and homes? Much to my dismay, one of my favorite objects was recently pulled from the show due to lending issues. It was a Swahili bao board from Tanzania. Bao is a capture game that is wildly popular on Africa’s East coast. As with any culture, games are a common way to pass time and entertain people of all ages. Board games in particular are popular, due to their portability. The Swahili, who reside in the coastal regions and offshore islands of the countries of Kenya, Tanzania, Mozambique, and southern Somalia are no exception to these traditions. 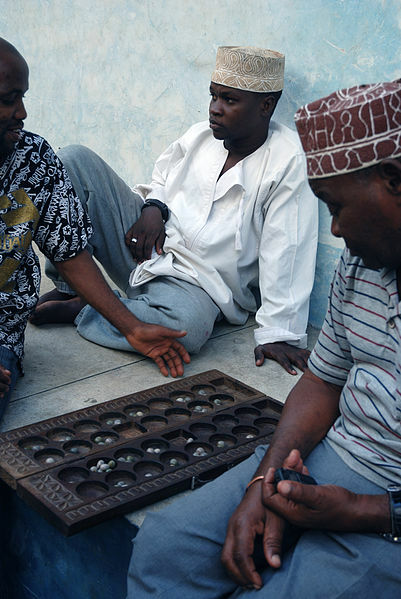 An adaptation of the more widely known mancala/mankala, Bao is found on Africa’s East coast. Unlike mancala, which has a total of twelve cups, Bao boards consist of four rows, with six to eight cups per row which are filled with seeds or stones. This is a scene of men playing bao is Tanzania. This is a fairly typical example that folds in half, making it great for portability. The design of the board is minimal. There are borders of traditional Swahili chip carving down the sides and in two rows at the ends. 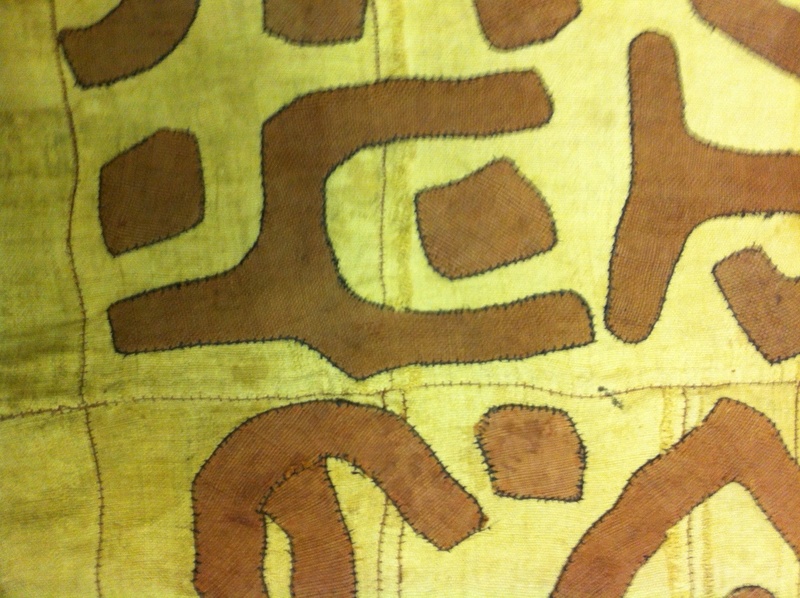 This style of carving/motif can be seen in Swahili furniture, architecture, and textiles. This board is likely newer. Older boards were often made of lighter wood. Another example from Zanzibar, this is one solid piece of wood. Note the Swahili chip carving along the borders in this example as well. The cup at the left end is used for seed/stone storage when the game is not in use. The arching form recalls Middle Eastern-style architecture seen in Swahili settlements. If you found these boards interesting, as I do, do some research for some more examples. There are so many examples and this brief posting has just scratched the surface (a little art humor for you!). Or, perhaps, even learn to play bao yourself! As the semester progresses, all of us working on the At Home in Africa exhibition are doing our best to balance class work with the many details and items on our to do lists. Included in my major considerations at this point are: whittling down and confirming the list of objects, gathering dimensions, mount and display requirements for each, and lining up the stands, pedestals, cases, etc. that we’ll need. The Galleries at Cleveland State University own a collection of pedestals and stands from previous shows, and a few cases too. I spent an afternoon making an inventory, spreadsheet and photo documentation of these items, also noting which ones will need to be painted or repaired. As we narrow down an idea of how many objects will require greater security and protection, I’ll be able to create a better list of acrylic cases that we’ll need to order, and what dimensions will match pedestals and object heights. 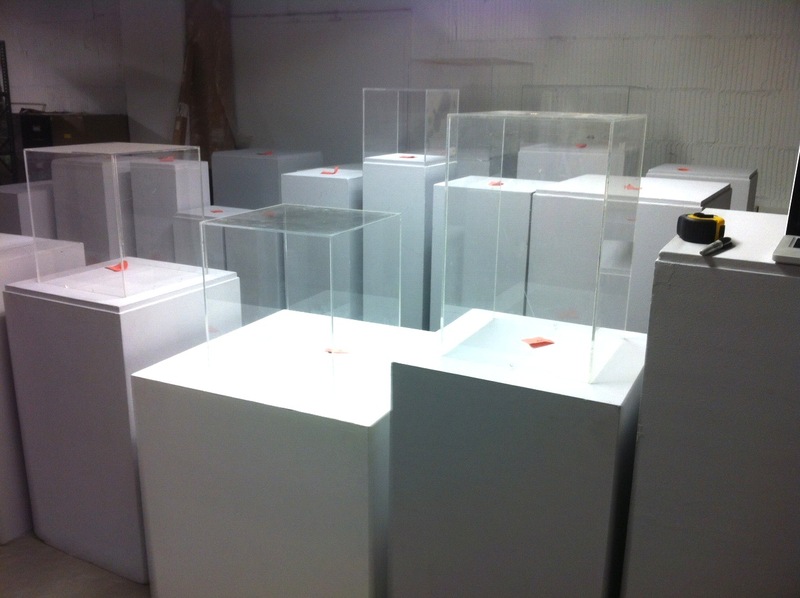 While we installed the current exhibition of student work on display in the gallery, we did paint quite a few of the pedestals, so that takes a few off my list for the summer! I am also joining the curator when I can to travel for collection visits. We see in person the objects we’re requesting for loans. On these visits, we have a chance to take a closer look at details not visible in photos, and we have a better idea of actual size. 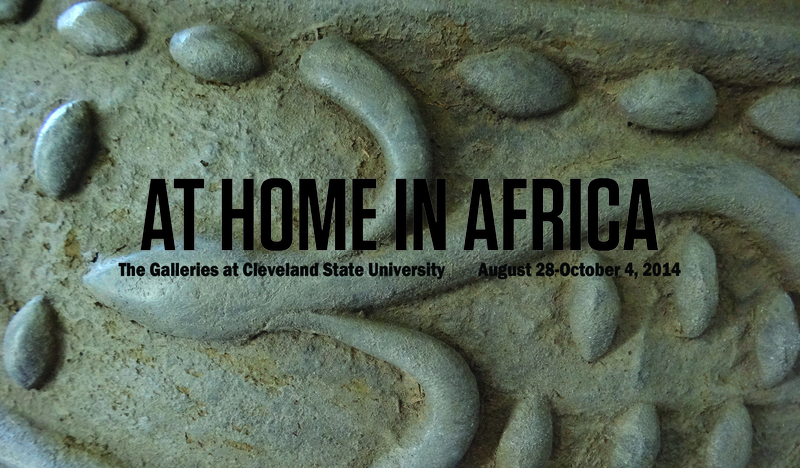 Our most recent visit was to the Kent State University Gallery Collection. 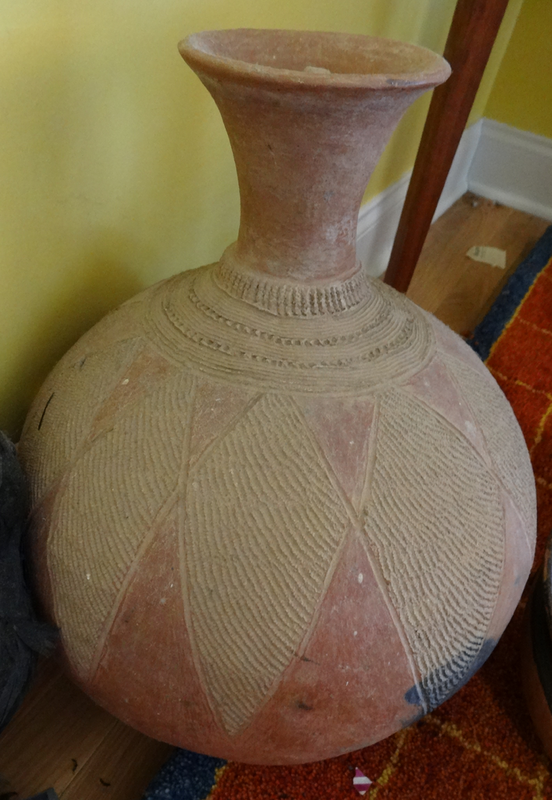 They have a fabulous collection of African works, and the pieces we are asking to borrow are in great condition. The gallery director and his assistant were kind enough to let us examine the storage areas, climb up on ladders to look over shelves, and generally poke around. With this advantage of an in-person review, we did decide to change a few of our requests that had been originally selected from their online database. We also took measurements and created a mini pop-up studio to photograph the objects for the catalog, for our records, and for detail shots. One of my main jobs as an intern for this exhibition is to write and edit phone tours, which will be available for the listening pleasure of visitors. These phone tours a great new technology for the world of exhibitions. They are informative, without bogging you down with an overload of facts and information. 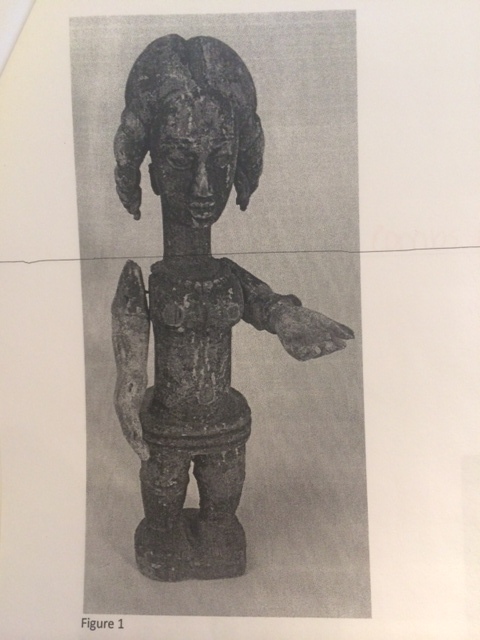 This wooden Ibibio puppet depicts a graduate of the fattening house, a Southeastern Nigerian rite of passage whereby young girls are trained for marriage. While moving from one life stage to another, girls are molded to be respectful daughters, wives, and mothers, who are responsible for passing on and preserving centuries-old traditions which may not survive otherwise. The fattening house is a practice that upholds these values and traditions. Body image is very much a part of the Nigerian culture, and this puppet signifies the transformation of a young girl’s body into adulthood. The puppet is carved with facial features that are fairly realistic and emphasized by white kaolin makeup. Her hair is coiffed in an elegant and elaborate style, enhancing her beauty and newfound status as a woman. The white color of the puppet also represents the natural lightening of the skin which occurs during a girl’s period of seclusion. Another implication of time in the fattening house is shown by the puppet’s arms and legs, which are plump and rounded. The puppet also features adornment in the form of jewelry. The necklace indicates the wealth of her parents and/or her future husband, and the waistbeads further round out her figure. The fattening house, which still exists in some communities, requires girls to be sequestered and fed with no exercise but to consume calories. Such foods include large portions of porridge and yams, accompanied by plenty of water. It is a belief that the thicker a woman’s body gets, the more beautiful and appealing she will become to male suitors. Along with plenty of food and drink, girls sleep and are regularly massaged. The massaging directs the increased fat to a desired area of the body so that it is shapely and pleasing. During their time in the fattening house, girls are attended to by mature women who teach and prepare them for their transition. There is more to their seclusion than eating as they must receive instructions and education skills to become a wife, mother, and homemaker. Those of us whose internships involve the feat of connecting a long list of beautiful objects to the gallery display space are facing the usual challenge: how many pieces can we physically display, but in a way that still allows the viewer to see each one in its best light? This is the first time I have worked on an exhibition design, and in the spirit of communicating to others who may follow the same path, our team will share with you the steps as we go, for better or for worse. At Home In Africa was divided by the curator into clearly defined sections; seventeen of them to be exact. Add a viewing room for an accompanying documentary film, and that makes eighteen. Armed with a floor plan from the gallery space, I loosely divided the square footage into sections by scale. We know which objects the curator wants to lead with at the entry, so the six home-themed sections will be displayed there, in the south gallery. After a visually defined turn of the corner, the visitor may take a right to the documentary or a left to the center and north galleries, for the eleven ethnic group sections. We have roughly 4000 square feet of floor space available. With these rough guidelines set, we are now balancing object display requirements (such as specific mounting needs, wall space, case enclosures and protection) with viewer sight lines and exhibition flow. We are fortunate in that we can actually do some of this work in the gallery itself. That allows for tape marks on the floor and examination of different views, ceiling and lighting considerations, etc. We can stand in different positions throughout the space as a visitor would, and then visualize ways to loosely define the sections and generate more wall space. With such an immense variety in form and size across these objects, we will not adhere to the 57-58” center line standard commonly used for hanging artwork. We will have to maximize the use of vertical space, and are exploring unique ways to hang and display textiles and other eligible pieces. We want the visitors to have access to the exceptional details of these objects. When possible, we also want to show items in the same way they would be displayed in an African home. This exhibition has a lot to say. I have been sworn to secrecy as to the total number of objects on the current list, but I will tell you it is a very large number. 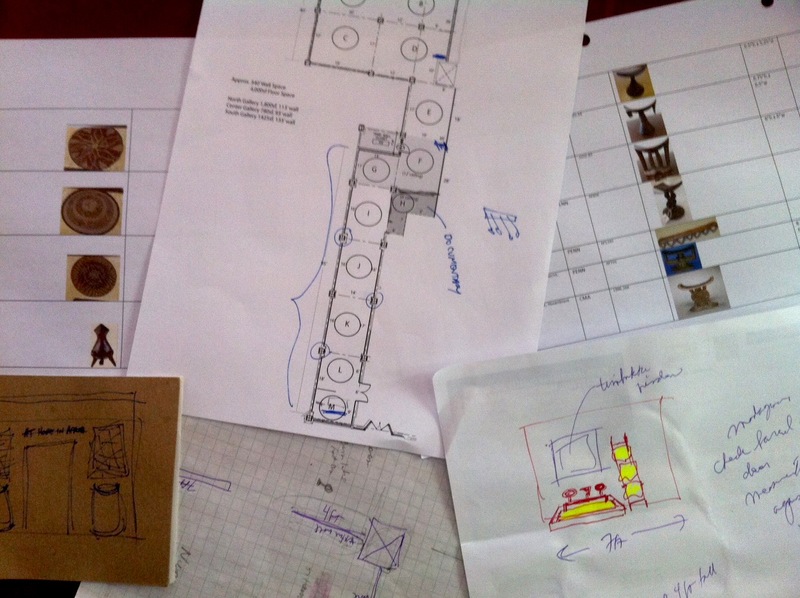 So, we are working the planning puzzle pieces to logically and beautifully organize the objects: to let them speak without too much noise, and to balance visual appeal within our space constraints. specify. While it simply sits in my dining room now, it was an essential household item for years. It hung outside my back door in Miango village, Jos, Plateau State, Nigeria. I bought it because it was beautiful–it was the first pot I ever purchased. Then I discovered how practical it was. Jos has the most perfect temperature of anywhere I’ve ever lived, at about 76 degrees F most of the year. But thirst can strike at any time, and I always have liked my water cold. It wasn’t always easy in Jos–you couldn’t depend on NEPA, the electricity company, keeping a fridge going long enough to make ice (NEPA=”Never Expect Power Again”). They constantly “took light.” Low-fired terracotta is a terrific cooler, though, and my dad on a visit made it a sling, so the breeze could help that cooling process on every exposed inch as it hung. He was a Merchant Marine in his youth, and learned how to macrame on the ship. It was the most secure hanging pot ever, well out of the path of kitchen traffic. The water from that pot was delicious. Its recessed lid kept out spiders, and its coolness was legendary. The water came out of the tap, then it was boiled, then poured into an aluminum container with a porcelain filter where it slowly dripped from upper chamber to lower, all the “dirty” trapped on the porcelain. From its faucet, a plastic pitcher. Then, finally, the pot! Even with a tap, safe water prep took some time and made you appreciate every delicious sip and gulp. The design on the surface allowed for a no-slip grip of its globular base, and the dark section was the pot’s birthmark, showing where it had touched its mates during the open fire process. I still like to palm its belly and remember the days when it was more than a decoration. I thank God and DSL that it reached the U.S. safely, wrapped in my clothes and stuck within a basket inside a cardboard carton. It still feels cool to the touch, even empty, but I think it misses its sling and its water. An object likes to feel useful, and I’m not sure it wanted to retire.